Looking for Information about Spiritism? Looking for places and ways to study Spiritism? Looking for information about and from Spiritism? Here is a collection of resources that we recommend. If you're new to Explore Spiritism , then start right here! Topics: God, soul/spirit, after-life, evolution & progress, faith, mediumship / spirit communication, spirit guides, meaning of life, ascension, love, charity, duty, accountability, karma. 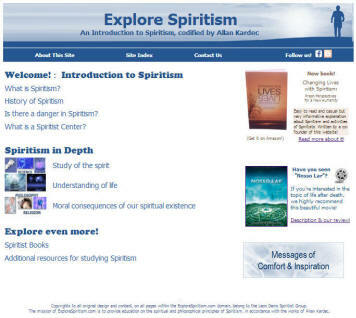 The ExploreSpiritism.com website is your gateway to an understanding of what Spiritism is all about and the knowledge it has to offer. Do you wonder what happens when we die? Or why we're here? Would you find comfort in knowing that you'll be one day reunited with those who have passed? Do you believe that you must be more than just a physical body? If so, what does that mean? Have you wondered wondered where your personal tendencies and inclinations come from, or why we're born into such diverse conditions? Have you asked yourself about God? Would it make sense for us to be accountable for our actions? Are you seeking a source of faith that goes hand-in-hand with reason? You've come to the right place! Check it out! As the dynamic extension of the Explore Spiritism website, our Facebook page serves as a way to offer our fans periodic posts with inspiring quotations, articles on various topics from the Spiritist perspective, resource suggestions, announcements, links with commentary, and more. The Explore Spiritism blog is all about understanding and reflecting on life, taking inspiration from the Spiritist teachings. Here you’ll find news, inspirational texts, resources, personal reflections & commentary, and much more. Subscribe to get email alerts on new posts. Whether they are scientific studies, spirit revelations, moral or philosophical explanations, biblical interpretations, educational narratives, recounting of personal experiences, or inspiring and motivational messages or teachings, these books all share in the common goals of helping us to understand our true spiritual nature and encouraging us seek out a continuous inner transformation. 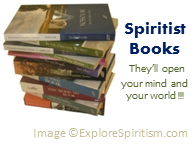 We have listed here some places where Spiritist books are available. Some books have also been made available for free download. Written by a co-founder of this website! As a friendly invitation to learn about Spiritism, this book provides an overview of the fundamental principles of Spiritism and the activity of Spiritists, as well as clarifications regarding some common misconceptions that people often have. An underlying message is the value of the knowledge that Spiritism offers to those who study it. The author also includes some of her own experiences and reflections as she came to learn about Spiritism. Learn more at the book's website. Read here about What Goes On At A Spiritist Center. If you are in the US, check the United States Spiritist Council page to see if there is a registered Spiritist Center in your area. If you are in the UK, check here for the centers listed on the British Union of Spiritist Societies website. Canadians can check the Canadian Spiritist Council website. There are Spiritist Centers in other places as well. For other specific countries, check for them by searching online. You may be surprised! This is a highly recommended blog in which the author, Brian Foster shares a great deal of information about Spiritism, supported with examples and references that he encounters in Spiritist literature and other Spiritist resources. Brian is also the author of several books he has made available on Kindle. Check them out on this blog. Kardec Radio is a weekly, Spiritist on-line radio show that focuses on health, spirituality, and spiritual awareness. Each week, the host introduces the topic for the day, with some comments regarding the Spiritist perspective, which is followed by one or more guest interviews. They have had a great line-up of guests so far, with more to come! You also listen to previous shows with on-demand audio accessible right from the website. Allan Kardec on January 1st,1858. The Spiritist Magazine is published by the International Spiritist Council. You can purchase digital additions or subscriptions, published via Zinio, at this site. These live web meetings are sponsored by the United States Spiritist Council. Check this page for current schedule and upcoming topics. An online course in Spiritism, designed to promote the study and practice of Spiritism, while contributing to the preparation of Spiritist practitioners. At Spiritist Network, you will find a growing collection of videos, including Spiritist talks and presentations, given at Spiritist centers, symposiums, and other events and venues. These videos cover a wide range of topics, including not only the Spiritist principles, but also how they apply to our everyday life. The Spiritist Society of Baltimore broadcasts meetings online. Saturdays 6pm. Check their website for scheduled topics. The Toronto Spiritist Society broadcasts meetings online. Check their website for currently scheduled times and topics. These groups post talks given at their Spiritist Centers on YouTube. Click the images to link to their channels. There are several Spiritist groups and pages on Facebook that offer inspiring messages, articles, announcements, etc.